Works are progressing well against the programme. Second air test carried out on Code 6 home, prior to plastering 2.19 achieved. Plasterers commenced boarding the stud walls in the Code 6 plot. In the Code 4 home the painter has applied a mist coat and the joiners have completed their second fix.. 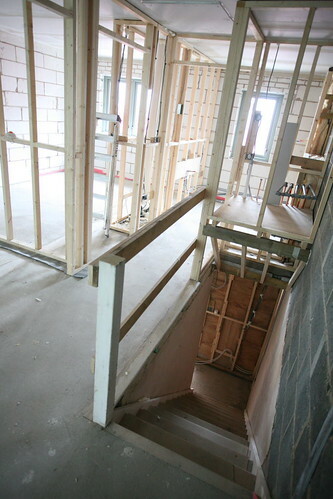 In the Code 6 plot the plasterers have wet plastered and skimmed the entire first floor and started on the ground floor. The plumbers and electricians have second fixed the Code 4 plot. Plasterers have completed the Code 6 property. Scaffolders have erected a scaffold to allow the boiler store to be constructed. Kitchens have been fitted in both the Code 4 and 6 properties. Joiners have commenced second fixing the Code 6 property and it has also been mist coated by the painters. The NHBC are carrying out Building Control and Warranty Inspections. The Inspector is visiting Site regularly intervals as per there key Stage Inspections requirements. The last visit was on 2 May, when the homes were at pre-plaster stage. The inspections to both properties showed no issues or defects.